Hope y'all had a Happy Thanksgiving. I've missed talking with all of y'all. It's like a part of me has been missing. Sorry I’ve not been on much, but as you know this week has been a bit hard on me and I’m not back into the swing of things. I don’t want you guys to think I forgot about y’all. I hope everyone had a great day with great family and friends. My Thanksgiving was great. It was quite interesting. Mom usually handled Thanksgiving, but now it’s up to sis and I. Too goofballs in the kitchen made for a very interesting experience. There was much chaos that day. My husband and sister throwing stuff at each other didn’t make matters better.....oh, No worries, it was fun throwing. My sister and husband are like siblings. They are always picking on each other, playing pranks, you name it. Everyone was in Great spirits and the day couldn’t have been better. Well let's get to what y'all are here for.....the cookies. I made you some Christmas cookies. When I saw these cookie cutters at Fancy Flours, I knew I had to get them. I mean how cute are ornaments turned into Santa? So I bought them right away. I haven't made the Santa ones just yet. The wheels started turning in my head when I got them though. 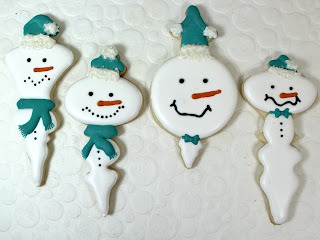 I decided to make some snowmen first. What do you think? I thought you may like them. I've got a bunch of designs going with this set. Let me know what you think about them. I hope everyone had a great Thanksgiving. What was your favorite thing about it this year? Cute as always! 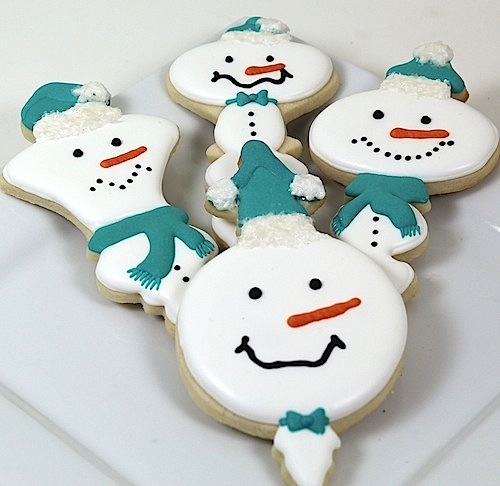 I just love snowmen and blue and white snowmen are my FAVORITE! Love them all! Thanks so much for the sweet comments. I just stumbled onto your site, I LOVE it.. I too love to make cookies and decorate them as well as cakes.. but cookies for me are the best. Thank you for sharing I look forward to seeing more of your creations..